Tesla wouldn't say specifically how much its fees will be, but it said charging would cost less than the price of filling a comparable gasoline car. Tesla wouldn’t say specifically how much its fees will be, but it said charging would cost less than the price of filling a comparable gasoline car. Electric car maker Tesla Motors has decided to stop offering unlimited free use of its 734 fast charging stations worldwide, just months before it’s scheduled to start selling a mass-market electric car. Tesla Motors Inc. says cars ordered after Jan 1, 2017 will get roughly 1,000 miles worth of credits each year for use at the Supercharger stations. But after the credits are used, owners will have to pay fees that Tesla didn’t detail on Monday. Vehicles ordered or sold on or before Jan. 1 would still get unlimited free charging. The move means that those who buy Tesla’s mass-market $35,000 Model 3, which is due to go on sale in the second half of next year, won’t get unlimited free charging. Tesla wouldn’t say specifically how much its fees will be, but it said charging would cost less than the price of filling a comparable gasoline car. The company says it will release fee details later this year and that prices could fluctuate over time and vary by regional electricity costs. Still, the move shouldn’t hurt Tesla sales because the company remains the market leader for electric vehicles, and owners don’t use the stations that often, said Tasha Keeney, analyst for the industrial innovation fund at ARK Invest. Tesla owners charge their cars at home more than 90 percent of the time, she said, using the Superchargers mainly for trips or when they need extra range. At the average US electricity price of 12.9 cents per kilowatt hour, it would cost $9.68 to fully recharge a Tesla Model S with a 275-mile battery at home. “EVs are the way forward. Tesla is in a really good position with 30 percent of the market. We don’t see that changing,” said Keeney, whose fund has holdings in Palo Alto, California-based Tesla Motors Inc. Buyers of new cars ordered or sold on or before Jan. 1 must take delivery before April 1 in order to get the unlimited free charging. Tesla CEO Elon Musk has said previously that Model 3 owners would have to pay to use the charging stations. Tesla’s stations are used only 5 per cent to 10 per cent of the day, Keeney said, but many Tesla owners use them as a social gathering place to talk with other owners. 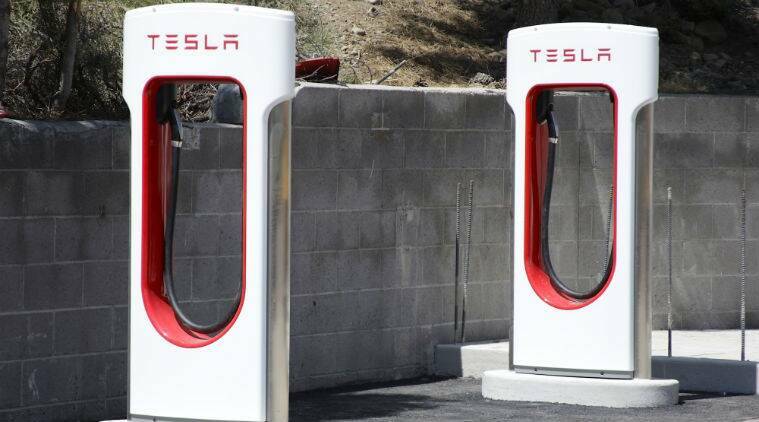 The Supercharger stations can give the cars 170 miles of range in a half hour. A 30-amp public charging station can only do 10 miles in a half hour, the company says on its website. In the US, charging stations are across the nation, but many are concentrated in population centers long the East and West Coasts. The stations were set up to enable long-distance travel by Tesla electric cars. The company’s Model S sedan can go between 219 and 302 miles per charge depending on battery and software configurations. Tesla says the change will let it expand the supercharger network and it will not make a profit from the charging stations.